Thanks for keeping track and sharing this data, Steve! Steve, thank you for putting in the hard work to help lots of eager gamers play lots of interesting games. I had a blast. I ran the FreeMarket game on Thursday @ 2. I don’t remember either player’s name, though. 2pm thru 4pm Friday : Fiasco by me, Jon C, 4 including me. 2pm Saturday: Technoir, you’ve already got it in there, it was run by Mark D.
6pm thru 8pm Saturday: Microscope game run by Ryan W. 5 players, including Ryan. It was also my highlight of the con! Games on Demand was amazing, hope you guys keep getting bigger every year. I know I will be back. 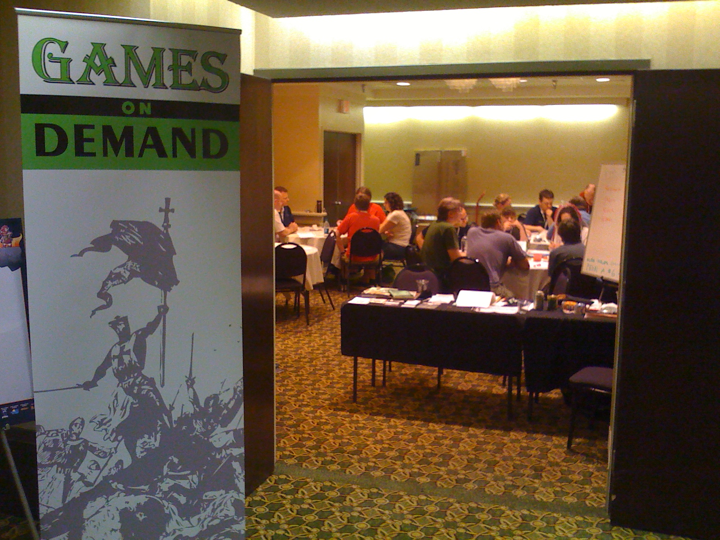 Games on Demand @ Origins 2011 didn’t pick up nearly as many players, but we’ve been upgraded to a more central location for next year and given the “thumbs up” by the Executive Director of GAMA. This is a great source of information for the event. Thanks for sharing it with all of us! I ran at least one game that’s not in the spreadsheet, too: a second Razed game on Saturday at 2pm for five players. 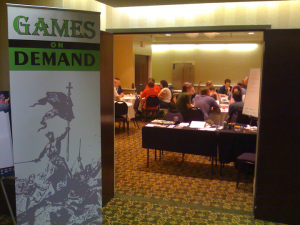 Games on demand meant constant fun things to do between the exhibit hall closing, and late night games at the hotel. It meant new friends, many of which I’m still in touch with. It meant finding brilliant new games, and getting to playtest exciting new ones that aren’t even out yet. It meant good memories, good times, and the steadfast resolution to do so again next year. Games on Demand was great this year! I made a point to at least stop by every day, and actually did the bulk of my gaming in there over the course of the con. It’s excellent for trying out things you haven’t played before, and meeting new folks and playing with people you wouldn’t have met otherwise. The only downside was that the room did get a bit noisy sometimes – there’s so much awesome stuff happening in a relatively small space, all at once! There were a few points during some of our games that some of the more soft-spoken players were having a hard time being heard. Other than that minor point, though, thumbs up all around, and gigantic props to everyone that helped make it happen! I ran the Trail of Cthulhu game on Friday morning. We ran for a slot and a half.